Michael was born in Boston and raised in Toronto. 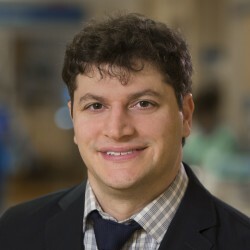 He completed his medical school at the University of Toronto followed by his internal medicine and adult critical care training residencies, also at the University of Toronto. He pursued his research training at the University of Pennsylvania, completing a Master’s of Health Policy and Research. He enjoys spending his free time with his friends and family. He lives in Toronto with his wife and 2 children. He is an avid sports fan and longs for the day that his Toronto teams experience the same success that his beloved New England Patriots have enjoyed throughout much of his adult life. Detsky ME, Ailon J, Weinerman AS, Amaral AC, Bell CM. A two-site survey of clinicians to identify practices and preferences of intensive care unit transfers to general medical wards. J Crit Care. 2015 Apr;30(2):358-62. Detsky ME, Balter M, SK Sridhar, Granton J. Under pressure. New England Journal of Medicine. New England Journal of Medicine. 2010; 363:449-54. Detsky ME, McDonald DR, Baerlocher MO, Tomlinson GA, McCrory DC, Booth CM. Does this patient with headache have a migraine or need neuroimaging? Journal of the American Medical Association. 2006, Sept 13; 296(10):1274-83. Detsky ME, Chiu L, Shandling MR, Sproule ME, Ursell MR. Clinical problem-solving. Heading down the wrong path. New England Journal of Medicine. 2006, July 6; 355(1):67-74. Detsky ME, Sivilotti ML, Kopp A, Austin PC, Juurlink DN. Deliberate self-poisoning in Ontario following the terrorist attacks of September 11, 2001. Journal of the American Medical Association. 2005, Oct 19;294(15): 1900-1.